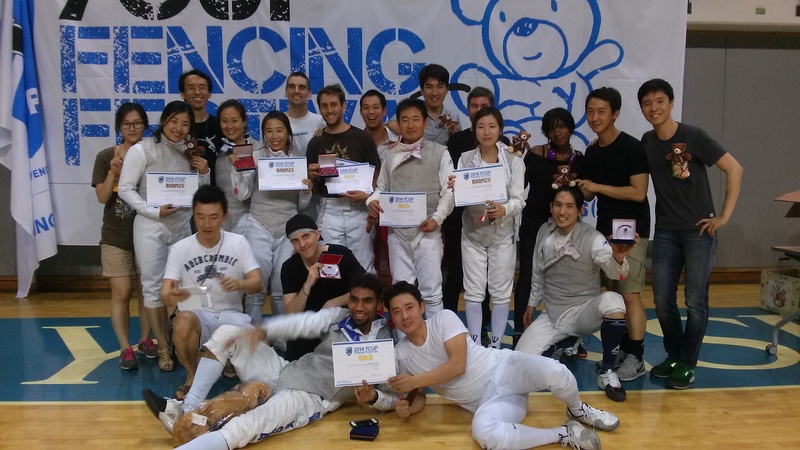 As the US Summer National Championships blew my Facebook feed up with pictures and witty retorts by coaches, refs and competitors I joined my Seoul Fencing Club teammates at Yonsei University for their Fencing Festival. 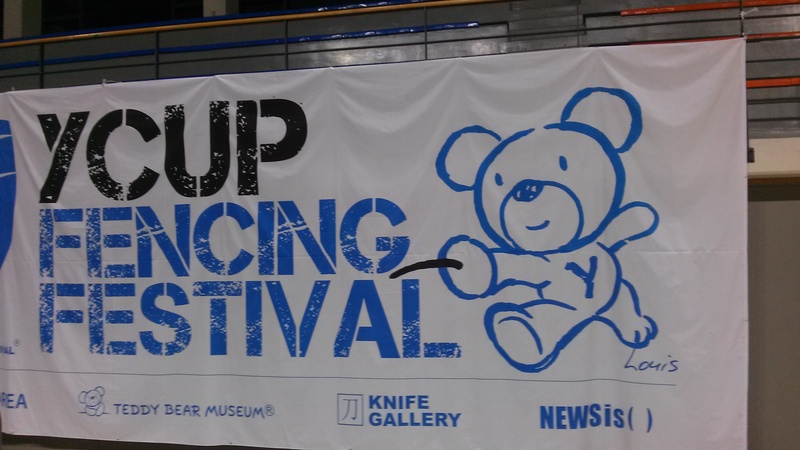 This annual event is one of Korea’s biggest fencing tournaments. The day began with individual tournaments. Normally this would be a simple event but today we were told the pools would be 2 minutes bouts to 4. Slightly strange but the bout committee had never handled such a large crowd we quietly shook our heads and fenced our butts off! Well, everyone except Geoff that is. Despite this being his last tournament in Korea (he’s moving to Hawaii at the end of the summer) he was told he couldn’t fence pools. You see, Geoff won this tournament last year and between that and their “perfect number for pools” the bout committee decided he would simply advance to the second round with the first seed. Strange, but I guess this is a different country right? All of our teammates did well in the pools, I took 4th, Jin, 5th and Francis 11th after the first round. Naturally we grabbed some lunch but upon arriving back at the venue were hit with yet another surprise. Direct Elimination bouts would be fenced to 5 instead of 15! Well, at least for the first few rounds as they gradually were upgraded to 10 and then 15 points for the semi-finals. I strolled through the 5 touch DE’s without too much trouble and was happy to get to the bigger bouts. Although I performed well all morning I didn’t really feel like I was fencing well until the semi finals match. I was up against an older gentleman who had traveled all the way from Busan (roughly 6 hours by bus) to Seoul for today’s tournament. We were touch for touch when suddenly he picked up 4 in a row. This guy was fast and accurate. He didn’t leave a lot of room for error. I was able to squeeze back to a 2 point deficit before entering the 1 minute break. New plan, lead with a flick or feint to the hand before finishing deep. Less is more right now and as my new tactics began working he pulled a toe touch out of nowhere! I knew in my head that I needed this touch but couldn’t help but smile as my opponent back-peddled into his warning track where I landed a perfect shoulder with barely enough force to watch him fall in slow motion. Reaching out I noticed his smile and laughter and realized that both of us were loving the match, regardless of the outcome, regardless of the language barrier. 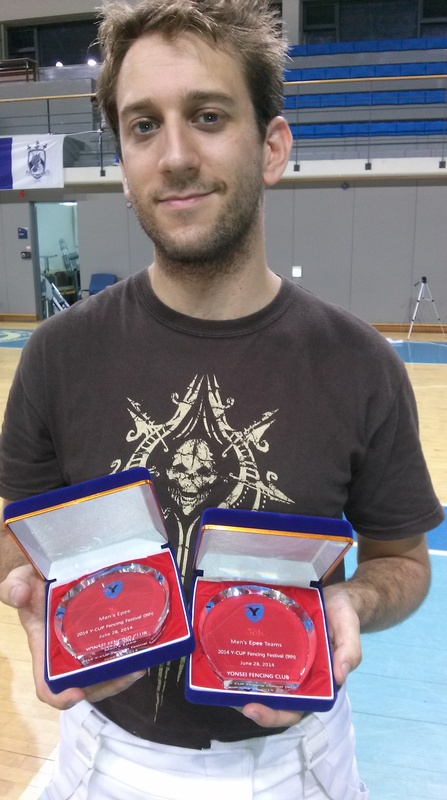 Unfortunately his lead was too much for me to overcome and I ended the individual tournament with the Bronze. 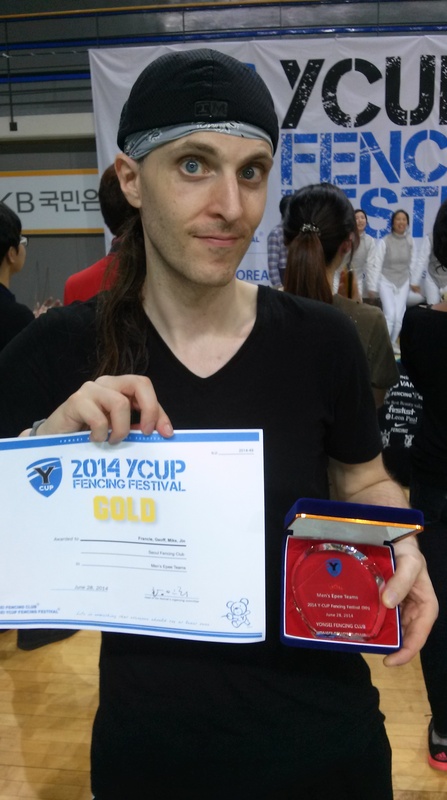 Happy with my individual success it was time to focus on the upcoming team tournament. In these 45 touch relays Geoff, Jin, Francis and I would have to work as one; coaching each other, armoring and keeping spirits high. 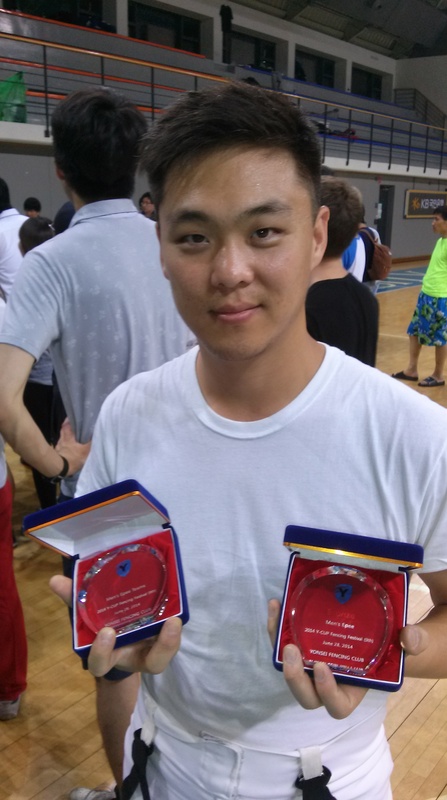 We came out guns blazing and bowled over the first two teams with Francis showing off some magical skills and earning MVP for his Harry Potterlike affinity at grabbing the quidditch, I mean scoring! Each bout I did my best to come up with some magicical pun for him when suddenly we found ourselves in the finals! Tired from the days double tournament, equipment questionable and a few extra bumps to our bruises we knew this would be the toughest match yet. 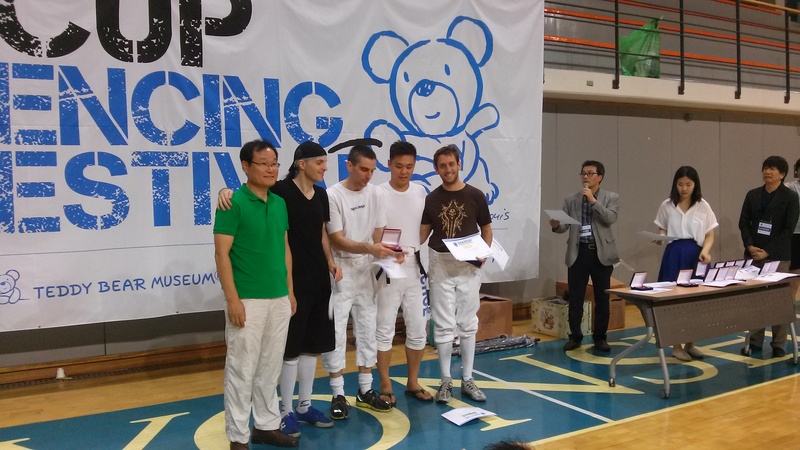 AK’s fencing team hailed from Daejeon, a short 2 hour ride from Seoul. They had picked up 1, 2 and 3 seeds after pools and knocked the gold and silver individual medalists from Busan. We’d fenced two of them before and knew their speed and some tactics but it would come down to each touch. Jin went in nervous about the rematch with his only loss from his pool and showed off some serious skills. I swear I heard him scream “My name is Inigo Montoya” after one point, but I may have been hallucinating. In the end it was my job to anchor us for the win. Thanks to my team’s blazing speed and affinity for stabbing Koreans I had an ample buffer going in to the match. That didn’t stop me from eating up every moment of victory! 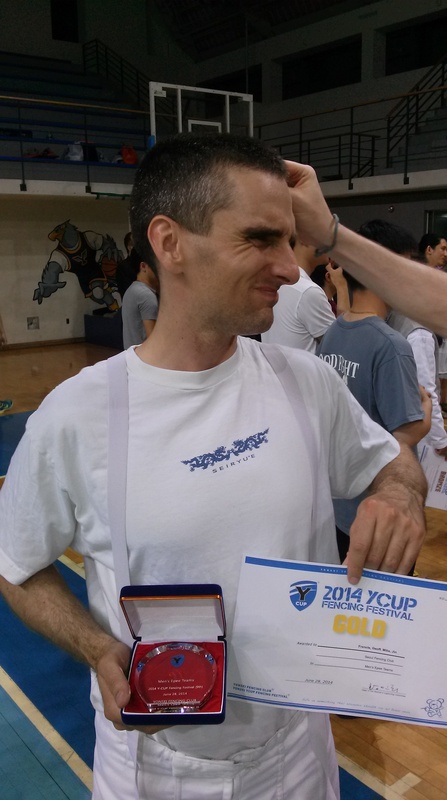 Its truly been a pleasure training and competing with Geoff as a teammate at Seoul Fencing Club and while he’s unsure how many Koreans will actually miss his American personality I know the English speaking community will! Perhaps this is why we were able to convince everyone to go out with the club and enjoy some amazing barbecue and celebrate the team victory! Gonna have to visit this guy in Hawaii! 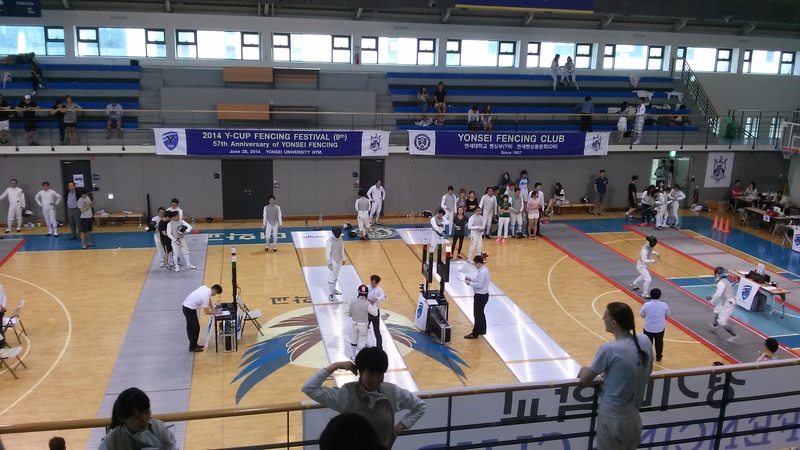 I found your blog while searching for fencing lessons in Seoul. I’m trying to find out if there are lessons for high school age students at this club, and find out where it is located. I’ve finally convinced my son to give it a try. Thank you for the information! Glad I could be of help. SFC is an amazing club! Does your son speak Korean? Hi there I visited SFC over the past 2 weeks. I wanted to get some of the guys facebook to keep in touch but seems that everybody was leaving in a hurry or probably I was over indulging in fencing there. 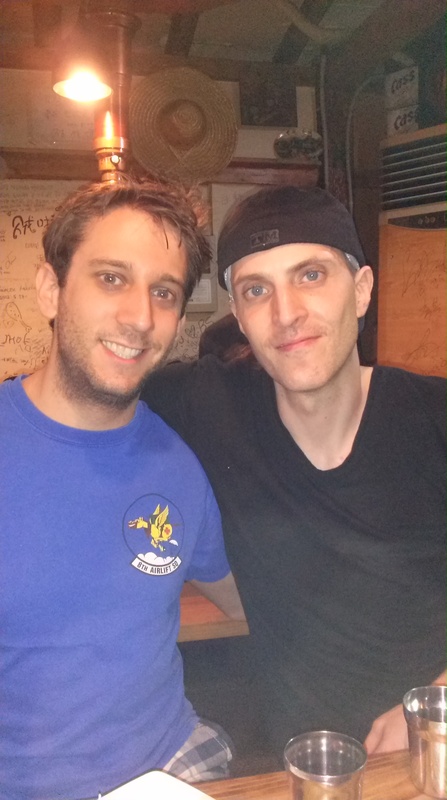 I remember meeting francis. Would you have his facebook name? Hi there my id is Yazzywazzy. I will be going kr again maybe in oct or feb so if you are back probably will meet you!